The protagonists of the recently premiered film, T-Junction, are a marvel to watch. 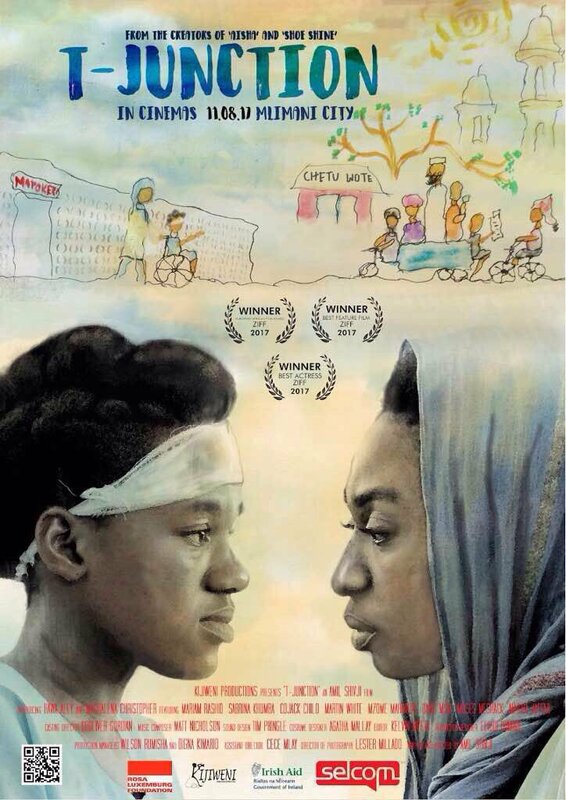 Although dubbed “An Amil Shivji’s film”, it is a collaborative work that brings Tanzanian talents as they attempt to make sense of our society. What is particularly impressive is the way the scriptwriter who also happens to be the director has juxtaposed the role of the starring. There is the young Fatima (Hawa Ally) who seems to be the starring. But this feeling does not last long when Maria (Magdalena Christopher) enters the scene. One then gets a sense that Maria could be the ‘alter ego’ of Fatima as she struggles to come to terms with the contradictions of her society. As such, her experience embodies Tanzania’s crossroads. These crossroads include the questions of race, state power and economic (dis)empowerment. As a daughter of the later Iqbal Hirji, whom we never get to see in the film, Fatima has what one may call ‘Indian heritage.’ But Mama Fatima (Mariam Rashid) was his African domestic worker prior to their marriage. Whereas the widow deeply mourns the loss of someone whom she believes loved and accepted her irrespective of ‘class and color lines’, the orphan hardly finds solace in a memory of an “estranged father” who probably drunk himself to death. That is as far as we can get in unpacking the mystery of why T-Junction opted to start with the funeral of Fatima’s father. 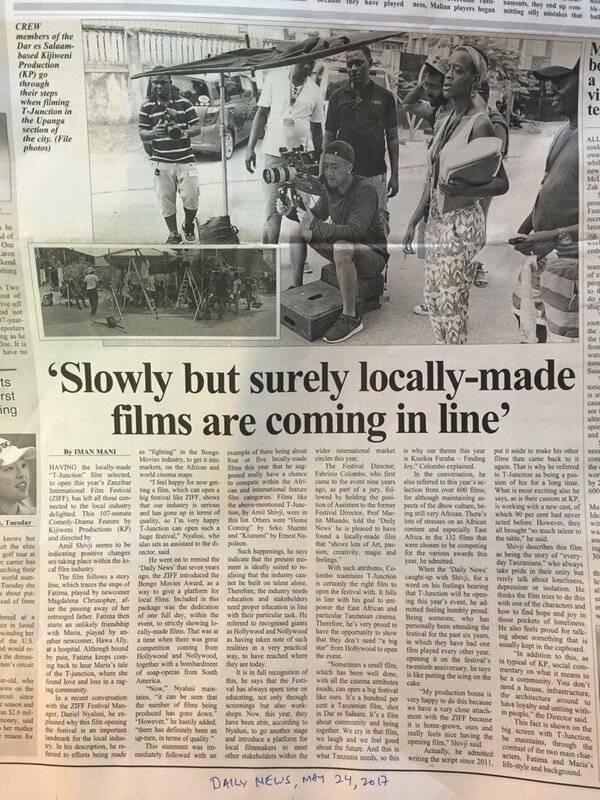 What we can surmise is that the film is attempting to tell those of us, who tend to view the ‘Indian Community’ in Tanzania as generally wealthy, that not all is rosy. The ‘Iqbals’ lived in a modest house though the funeral services took place in a prominent mosque. Yet ‘their house’ does not seem accessible to Africans probably because it appears to be in the areas that were historically – i.e. ‘racially’ – designated for Indians. Thus, the only people who came to comfort Fatima and her mother were from Tanzania’s ‘Indian Community’. To buttress this point, the film ensures that Fatima is asked if she does not have any friends who will come. We thus encounter Fatima making her first friend in the film when she goes to the hospital to seek treatment and enquire about a death certificate. This is when she encounters Maria who narrates to her about the story of the T-Junction. In a nutshell, it is a ‘surreal’ narration of how the state apparatuses bulldozes those who attempt to eke out a living through ‘street vending’ in what some theorists refers to as the ‘informal sector.’ It is also an account of what a young African girl, i.e. Maria, can encounter when she works for an Indian woman who seems to be related to Fatima’s father. To add nuances, the film indicates that even a seemingly exploitative Indian businesswoman who hires an African domestic worker can also be subjected to the gendered violence that emanates from patriarchy. Though it may seem coincidental, it is interesting to note that there is a real Fatima Bapumia who has published her research on Rationalizing violence Domesticizing Abuse: South Asian Experience in Tanzania. Therein she unpacks how what happens in the ‘private sphere’ of Tanzania’s ‘Indian Community’ is hardly noticed in the ‘African community.’ T-Junction thus gives us a rare chance to peek into that sphere in relation to what transpires in the public. Then there is what is hardly coincidental. As the film premiered, we witnessed another round of demolition of houses and business premises in Dar es Salaam. This time it is not only the downtrodden in the informal sector who are bearing the brunt, but also the ‘middle class’ in the ‘formal sector.’ In this sense, T-Junction is not a corner out there where ‘the poor’ struggle for a ‘right to the city.’ Rather, it is at the very heart and soul of a society in search of solace. They “came for the Jews, and I did not speak out—Because I was not a Jew.” When they come for the Marias, do we ‘speak truth to power’? Or we are not yet at the T-Junction?